Cranberries are sorted into three categories: premiums for the market, seconds for wholesale to restaurants for cooking and baking and thirds or 'rottens' that go to farmers for livestock. Apparently chickens and pigs love them. 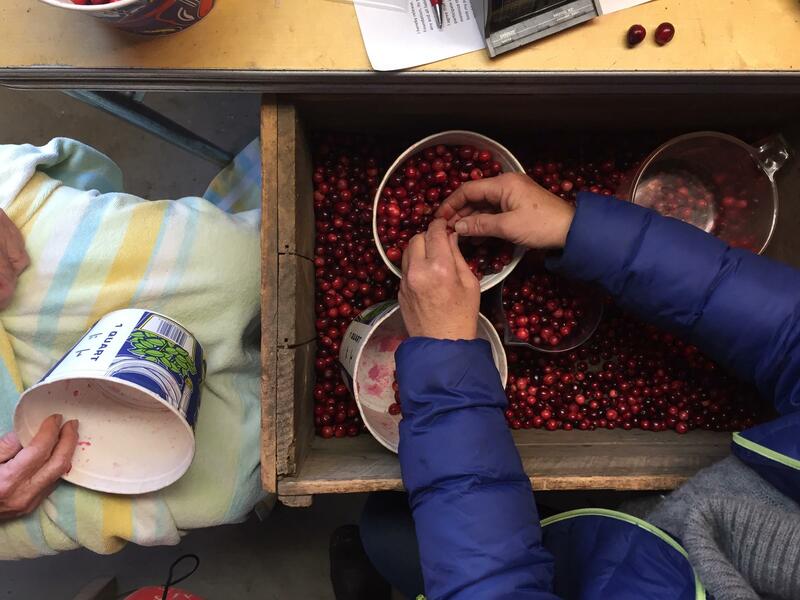 “We’re sorting the cranberries from rottens, seconds, and primary to go to market,” Annette Anthony said. She helps Vineyard Open Land Foundation distribute and market cranberries every year for the last four years. Annette Anthony (right) of the Vineyard Open Land Foundation (VOLF) and volunteer Sally Hamilton (left) hand sort cranberries in the refurbished 1920s barn. The Vineyard Open Land Foundation is the non-profit that’s been revitalizing this commercial cranberry bog in Vineyard Haven. By all accounts, bogs (usually located in kettle holes) were once a common sight around the Vineyard. This one was built in the 1880s but by the 1970s it was abandoned and turned into a campground. Eric Peters is the chairman of the board. “We’ve really restored the ecosystem that was here that’s an agricultural ecosystem. It is cranberries but we’ve also been doing it organically,” he said. They only use organic fertilizers and no pesticides. The non-profit started replanting this cranberry bog in 2004. It’s been a long process and one that really did take a village. “The gentleman who helped us with this bog since we replanted it unfortunately passed away this fall in a motorcycle accident and he and his wife, his late wife, had the first organic commercial organic bog in the United States near Plymouth,” Peters said. That would be Robert Keese of Cranberry Hill Organic Farm. He’s the one who came to the Vineyard and helped them replant the bog: dealing with the vegetation, and managing it. “He was coming and doing the cranberry harvesting with his machine and then when he passed away we found another gentleman on the Cape who came over with his helpers and did the harvesting themselves and then some of the people that used to come with Bob Keese to do the sorting here, have been back here four times for several days in a row doing massive amounts of sorting,” Peters said. The heirloom variety they grow called Early Blacks also came from Robert Keese. Carol Magee is the executive director of the Vineyard Open Land Foundation. “It had been anticipated that in the beginning of this, that half an acre would produce 2,000 pounds of cranberries and we have now achieved that for the past three years so we expect it will continue, the bog will continue to produce that many cranberries so we’re very happy,” Magee said. That’s literally a ton of local, organically certified, high in vitamin C Massachusetts fruit, grown with minimal inputs on only half an acre. Bags of cranberries from Vineyard Open Land Foundation's Cranberry Acres bog are ready for the market. Fresh whole cranberries freeze really well. “We dry harvest so when you see those bogs flooded in the fall or you see ads on television, when they wet harvest a bog they’re using them for juice berries,” Eric Peters said. Their premium berries are only sold whole and fresh. Carol explains how they flood the bog to manage insects. “April 15th to May 15th which is the time that will prevent the black-headed fire worm eggs from hatching. They hatch then the larva drown so it’s very good. It’s an old cultural cranberry bog procedure, the flooding,” she said. Back in the barn, Annette Anthony and Sally Hamilton are doing the final sorting and they have their own opinions about how to eat cranberries. “I don’t eat them raw but everyone else here does. This looks like a good one,” Annette said. They say the best cranberries make a hollow sound if you bite into them just right. Many recipes pair cranberries with orange. A lovely combination but why not try something with lime instead. The two tart fruits complement one another. Here’s my recipe for a smoothie. An immersion blender works just fine and it’s easy to clean up. I store fresh whole cranberries in the freezer and just take out as many as I need through the winter. Blend until smooth. Adjust to your tastes. Eric Peters from the Vineyard Open Land Foundation mentioned that fresh cranberries make a delicious cocktail with gin. Try muddling them in the bottom of a glass with some fresh lime or orange and experiment! This Cranberry-Lime Pie looks luscious with a cranberry curd. We found it on Epicurious.com from Bon Appetit, Nov. 2016.